Why do we include written or computer-based quizzes in training? First, I'll acknowledge that the ideal type of level 2 training evaluation is a skill assessment that simulates actual, observable job tasks. A quiz can be a useful tool for taking a pulse check during training. In some cases, a quiz might be the next best type of level 2 assessment if the resources available to you don't support a more robust skill assessment. A quiz can be used to complement a skill assessment, to test for critical knowledge that might not be easily observable. Depending on the purpose of the training, a well-written quiz may be able to fully assess whether learners meet the stated objectives. Okay, we've established that quizzes can play a productive role in training. And how well those quiz questions are written determines how productive that role is. Writing quiz questions well isn't just about writing them clearly. It's also about making them relevant to the job. Quiz questions are often written like trivia questions, prompting learners to simply recite facts rather than figure something out or apply knowledge in a job-related way. However, writing quiz questions in a scenario format is a relatively easy way to make them relevant to the job. Admittedly, the questions above don't change dramatically when converted into scenarios. But let's take a look at some reasons, grounded in learning theory, for why scenario-based assessment questions can be better. Cognitive learning theory suggests that we're more likely to remember newly learned information more easily if it's connected to something we already know or something simple we're familiar with. Continuously tying knowledge and procedures to realistic scenarios in training helps ensure that learners associate that knowledge with the job situation it applies to. In Herman Witkin's theory of Field Independent versus Field Dependent cognitive styles, he suggests that some people struggle to learn new procedures or concepts unless they're given context. He has pointed out the example of math, explaining that some students who struggle with simple math problems perform well on story problems, arguing that context makes the difference. The context provided by a scenario helps to care for this. Demonstrating relevance is one of the components of John Keller's ARCS model for motivating learners. Quiz questions that leverage job-related scenarios clearly connect that knowledge to the job. More information about learner motivation is available in an earlier post (What Are You Doing to Motivate Learning?) on this blog. Not all quiz questions work well as scenario-based questions. But in my experience, most do. As a general rule, I write all quiz questions as scenario questions. If I can't get one to work well, I'll usually run the situation past a peer before I succumb to writing the question another way. What are your thoughts? Do you feel that scenario-based questions are overrated? 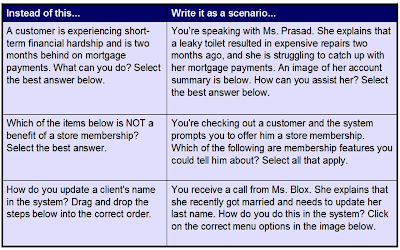 Or, do you agree that scenario-based questions are the way to go? And if so, do you have reasons other than what's listed here? I have been enjoying your post. I agree that scenario based questions would tend to elevate the learners experience and provide them with a means to create meaning for deeper learning or understanding. Scenario based questions when thinking of Bloom’s Taxonomy goes beyond the simple knowledge question, but provides the learner to identify with the content in application. For nursing students we like to construct questions in a more scenario story based to test knowledge and application of new material. When presenting new information I am wondering if a pre-test/quiz will engage the learner to try to pick out the knowledge needed to correctly answer questions presented at the beginning of a section. I think a pre-test can definitely serve that function. When the learners don't know an answer to a question, they will already be focused on that content when it appears in the course.